Hard to find low profile cube van; NOT dock height. has step bumper and trailer hitch, brake controller. Alpine Bluetooth Am/Fm stereo. Craftsman Ball Bearing Roll Cab toolboxes on both sides towards front of box. Storage shelves on both sides . handy to store whatever! New front brakes, calipers, brake lines and trans lines . Easy truck to work from has been handy for many years, decent gas mileage! Truck runs and drives great and ready for work....5.7 V8 179xxx miles. Thanks for looking! 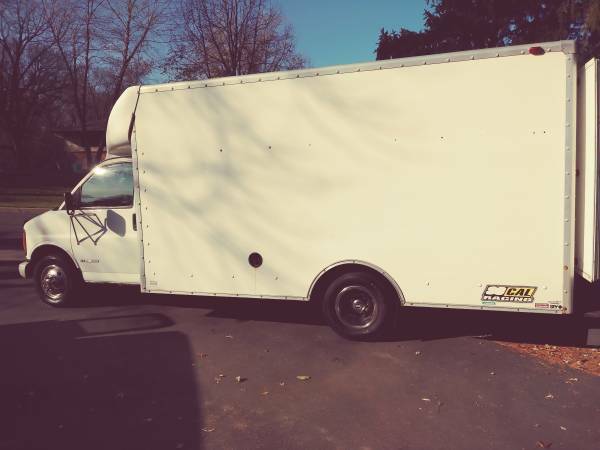 I do not need help selling... Chevrolet Gmc Transit Tradesman Box truck Commercial van.